Will Gorgeous Gig Young’s Alex Burke have his day when he introduces his soon to be fiance, Laurie Tuttle to ol’ blue eyes? This film was one of my first introductions to Doris Day, and it led to a bit of a teenage crush – as you regulars will know – on her love interest. In this film, Young at Heart (1954) Gig Young stars as the unfortunately named Alex Burke, who stole my heart (and again more recently in Teacher’s Pet (1958)). So after lovely Michaela announced her second Doris Day blogathon I was first in the queue putting my name down for this my favourite of Day’s movies. Last year, I missed this film choice, but relived it through a blogging friend’s lovely review. This a film which I loved not only for Young, but also the supporting cast, the soundtrack and memories I have surrounding it. This as Day’s character Laurie was one of three sisters, like me, it briefly inspired me to be a singing group with mine (even though I can’t sing or play an instrument) as the HUG Sisters (with the initials of our first names). But seeing it spelt out our names also as UGH, the idea was abandoned. At least that’s how I remember it… my mother may remember things differently. Anyway, I also loved the fabulous soundtrack – although it was at times more like an in-film record promotion – with Sinatra and Day singing their wee hearts out. But what’s it all about? The film starts with Gregory Tuttle (Robert Keith), an accomplished flutist and musician who continues the opening tune where Sinatra’s lovely opening number ends. His sister Aunt Jessie (Ethel Barrymore, why I didn’t think of her appearance here last year for the Barrymore blogathon is plain baffling!) watches the wrestling, it’s clear a bet is in place. His daughter Laurie (Day) appears, grabs a snack then heads upstairs. Minutes later she’s down the stairs again with her sister, Amy (Elisabeth Fraser) in tow as big sister Fran returns home from a date in a state of excitement. Eldest sister Fran (Dorothy Malone) is superexcited as the first of the three Tuttle sisters to announce her engagement. Cue girlie squealing, which sisters do (believe me). This to a property developer Robert Nealy, and after just seven dates. The single Tuttle girls have a sister to sister chat in their shared bedroom (who shares a bedroom with your 20+ sister even in the 1950s? ), and naturally the conversation gravitates round men. As they do. And no they don’t conjure up the 1950s equivalent of Jack Nicholson, (the man himself was only 17 when this film released)… like those 80s divorcees / widows in The Witches of Eastwick (1987)). Both have noticed the young plumber has a bit of a crush on Amy. But they sort of agree on either a double wedding or shared spinsterhood. The Tuttle girls and their father have a musical quartet with our Doris Laurie singing and playing the piano. Amy’s on the violin and Fran’s on the harp with all conducted by their father. As Amy is chatted up by the young plumber, Laurie is dragged off by a random child to see some puppies being born. And in the middle of the crowd, is the lovely, handsome.. Alex Burke (sigh) played by Gig Young. Of course Burke takes a bit of a liking to Laurie, and it turns out his father knows her father and he has the patter for charming girls – and their fathers – down to a tee. And after meeting Gregory, he invites himself for dinner and to be their lodger. All the Tuttle girls (and me) are smitten. As all Tuttle girls recognise he’s a bit of a catch – as he writes music, and has a jokey rapport with dad and even charms Auntie Jessie. Whats not to like love??? So we head to the beach and the entire cast are there, cue Doris Day bursting into song (at least twice), some serious flirting from the plumber, and all the women – apart from Aunt Jessie – making furtive cow eyes at Mr Burke. Cue more Gig screen time… sorry Doris (repeats this is a Doris Day not a Gig Young blogathon in head).. But he’s only got eyes for Laurie. He even gives Laurie a bracelet – despite the fact that Amy is dutifully sewing for him and Fran’s obviously delaying the June wedding in the hope of him. And it appears by the end of the night Laurie’s got the Gig.. so to speak. (Bloody sisters! I’ll admit I was rooting for the love lorn Amy here!!!). So then one day, fate becomes tangled and twisted… enter ol’ blue eyes, Barney Sloane (Frank Sinatra) to help Alex rearrange his music. A complete contrast in personality to the lovely Burke, but he sings and plays the piano (which Burke doesn’t). Where Burke is charming, Sloane seems distant. Where Burke’s miserable and loves being with the Tuttles, Sloane’s a loner. With Laurie taking more than a passing fancy with him, because he’s seen as a bit of an enigma. Albeit a cynical one. Sloane opens up to Laurie and plays and sings a musical number or two, thus confirming he’s got hidden depths. And Sloane falls for Laurie.. proclaiming his love for her. After he burbles on about being a man who hopes to shape his own destiny etc. He’s also got the equivalent of songwriters block with just a snippet of a tune…Sorry but he really is more than a bit of a downer. But his declaration of love confuses Laurie especially after giving her a kiss on the cheek (and this action annoys me). So does Burke get the girl? Is it the sisterly equivalent of bros before hoes? Will Day and Sinatra do a joint musical number? Does Gig Young get the girl or any girl? These and other questions are answered in the remaining part of the movie. As a Doris Day movie, it’s another of those lovely films with her choosing between two men, but you having the sixth sense on just who’ll get the girl. But unlike Teacher’s Pet, with Sinatra involved and as a billed as a musical there’s a lot more singing. The soundtrack sung by Sinatra and Day was a great addition to this non-musical with musical numbers littered throughout the film like this blog does random Dallas references (yup sneaked one in here). As it was a lovely film showcasing these favourite musical talents with many , many memorable musical numbers including Sinatra’s hits Someone to Watch Over Me and One for My Baby (And One More for the Road). Doris sings the excellent Ready Willing and Able and Hold Me In Your Arms. I do – despite the quips – love this movie, and Day’s Laurie was believably torn between her screen suitors Doris made her character spunky, fun and caring for others and this the perfect match to support the miserable Barney Sloane. But additionally her banter with Young was a delight. However I would have liked more scenes with Laurie perhaps with Aunt Jessie or big sister Fran to support her mixed up feelings. However, it was sad that her character had the lack of insight in her sister’s full on crush with Alex believing she hated him. Despite this being pretty obvious from the start as it was more than apparent there was a huge attraction there. Laurie also had a lack of insight into Sloane’s outlook on life and this mansplained to her on more than one occasion. Gig Young made his character as lovely, friendly and charming as always, and was believable in this role. And I would have like to have seen more scenes with him and Sinatra, after seeing his lovely on-screen rapport and bromance with Gable in Teacher’s Pet. However Laurie, as a chirpy Doris Day character obviously saw Sinatra’s Barney as a challenge, as she thought she could help and love this unpredictable man entering their lives. I was interested to learn that this film was in fact a remake of another non-musical movie Four Daughters (1938) but with John Garfield in Sinatra’s role. And which on reading how things develop in that movie … along with the addition of another daughter.. would make an interesting watch. So definitely on the look out for this film – along with his original version of my fave Jack Nicholson classic, The Postman Always Rings Twice (1981). However the Four Daughters ending was changed, at Sinatra’s request. And to be honest, this the ending I’d have preferred having read more on the original film. But just know after rewatching this film, that if I was Laurie Tuttle it would be a case of move over Sinatra, I’m still Gig Young at heart. 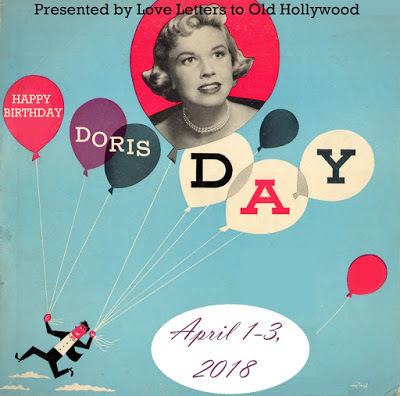 This post was written as part of the Second Annual Doris Day Blogathon run by Love Letters to Old Hollywood. Other film reviews with this cast featured on this blog include Doris Day in Teacher’s Pet and With Six You Get Egg Roll. Gig Young stars in my 5 Flaming Hotties post and also Teacher’s Pet posts. Frank Sinatra covered Can’t take my eyes off of you which featured in my 5 Reel Retro Soundtracks post. Robert Keith stars in my review of The Masks, a Twilight Zone tale. Elisabeth Fraser has an uncredited role as a Party Guest in my post of The Graduate and also starred in Bewitched. Great review! And, oh, I’m the blogger who wrote the lovely review last year! As I said, I was surprised by how dramatic things turned when Sinatra got in the picture. Doris Day was great in this film – as always – and I was also enchanted by Gig Young. Yes, was SO good to read your review last year, as I hadnt seen the film for so long… thanks! While I prefer Four Daughters to Young at Heart, there’s no denying this one has a charm of its’ own. And Gig Young is definitely preferable to his counterpart Jeffrey Lynn! Thanks- definitely checking Four Daughters out, heard this film even had a couple of sequels.. have you seen them? Loved and met John Garfield for the first time in He Ran All the Way and saw him in the trailer for The Postman Always Rings Twice, was totally enthralled by his acting. Reviewed it here if you seen it as love to hear your thoughts on it – also mentioned Garfield in my review of the Jack Nicholson remake of The Postman Always Rings Twice. How come I’ve never heard of this film? I read these commenters’ glowing comments and I feel like I’m really missing out here. Love to hear your thoughts as someone who has never seen it, and no problem re introducing you to it, you’ve reintroduced me to so many lost favourites through your blogathons! A very charming movie, although I have to admit that the first time I watched it I was disappointed that they had changed the ending of Four Daughters, which I grew up watching with great regularity. Nonetheless, when you’re listening to Doris and Frank, and watching Gig Young, I’ve got nothing to kick about. First time I watched it, thought it would end that way – having not sen the film – but then had a bit of a crush on Gig and (confess) didnt know that much about Frank Sinatra but disliked his character. I hadnt heard of it before, but always trust your recommendations! Will check it out for sure now! Hi Gill – what a lovely post to celebrate Doris’s 96th birthday today! I can’t believe I have never seen this one yet, but now I must. Sinatra and Day together! I did not get my own Doris post done yet; hopefully by the end of the week. Also a big Gig Young fan here too! This movie is right up my alley. Thanks – its my fave Doris Day film, but I loved Gig Young and Clark Gables bromance in Teachers Pet, reviewed it here if you haven’t seen it. They were fantastic! I love this movie. It’s pretty darn delightful. It’s kind of sad that Gig Young never seems to get the girl, though. I mean, he has three different women pining for him in Young at Heart and he doesn’t even get one! Thanks for participating in my blogathon, and I’m glad you were able to get the topic you wanted! Me too,, it is a very lovely movie. I did feel sorry as you say that Gig didn’t get a happy ending. Thanks for having me in this blogathon, and looking forward to that big announcement.